With so many companies in Southern Oregon to choose from when you need your garage door repaired, it can be difficult to know which call to make. American Industrial Door in Grants Pass has been handling garage door repairs all over the valley for over 25 years and we have the knowledge and equipment to handle any repair you may need done. From repairs to your garage door and problems with your garage door opener, American Industrial Door is the right company for the job. We understand that having a problem with your garage door can be very problematic, and that is one of the reasons we believe in a high level of customer service with each and every job that we do. American Industrial Door of Grants Pass is proud to offer same day and next day service as well as 24 hour emergency service in those cases that cannot wait. Garage doors can experience many different types of problems, from problems with the doors all the way to the openers. Obviously, the most common and serious problem is when your garage door will not open or close. Leaving your garage door open can leave all your valuable belongings susceptible to theft, while not being able to open your garage door could mean your car is trapped inside! When your garage door fails to open or close, there is usually a problem with the system of springs. The torsion springs on your garage door have a long life expectancy of about 10,000 cycles which means that your garage door should operate without problem for up to ten years, if you open and close the door approximately five times per day. With the sometimes colder weather in Grants Pass, this can also negatively impact the length of time that your springs could last. 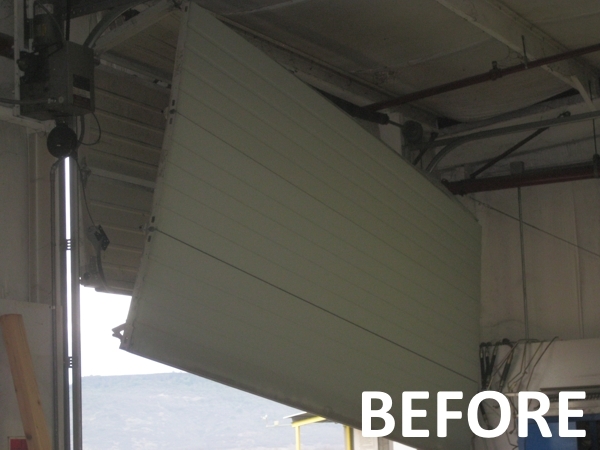 Whatever your garage door is doing that it shouldn’t, American Industrial Door of Grants Pass knows how to properly repair it. The other main part of your garage door that can malfunction is the garage door opener. Sometimes this is an easy fix such as new batteries in the opener, but it is often a much more serious problem. 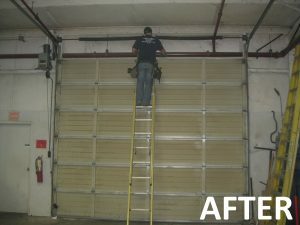 American Industrial Door is highly experienced with resetting garage door openers to work with your existing garage door effectively. If your garage door does not have an opener, you probably have a regular type of key lock on the outside of the door. If this isn’t the case, you may want to have one installed in order to properly protect your valuables. If you already have a lock on your door that is just not functioning well, American Industrial Door can help you with this as well. When American Industrial Door of Grants Pass arrives at your home to repair your garage door, you can expect only the best in service. 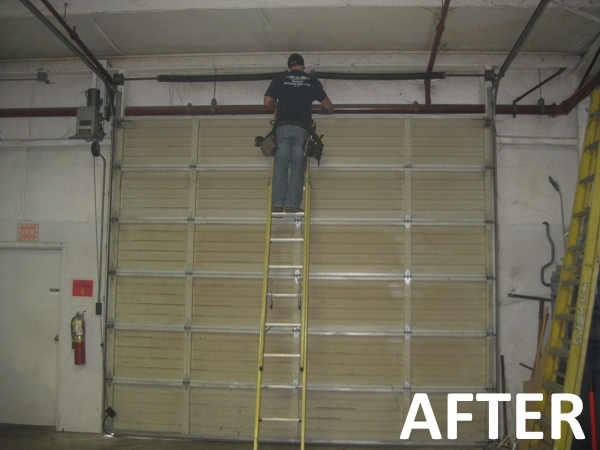 We perform a 12 point garage door tune-up with all service calls to make sure everything is working up to par. This is in addition to fixing the actual repair that needs done, just to ensure your garage door is ready for many more cycles of opening and closing. Your garage door either has a single spring system or double spring system and each are repaired in a different manner. At American Industrial Door, we believe in a thorough repair, regardless of how small or large the problem is. When we repair double spring models, we believe in replacing both sets of springs even though only one may be damaged. This ensures you won’t have another problem soon. This complete and thorough type of service is what you can always expect from American Industrial Door of Grants Pass. General overhead door service calls cover the unknown. If your only symptom is a garage door that won’t go up or down, a general service call will have our technicians on your site diagnosing your door problem and working to restore your door to full service. 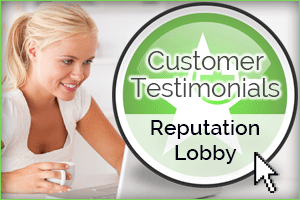 Our 12 Point Door Tune Up is part of our general service call and will get your door running smooth and quiet. When your garage door or opener is not working to your satisfaction, remember to call the professional technicians of American Industrial Door of Grants Pass. We work steadfastly to get the job done quickly and to make sure your garage door continues to work safely for your home and family. We always offer a free estimate before beginning any job so that you are well aware of what your home improvement needs cost.